Gucci's creative director Alessandro Michele chose the iconic Westminster Abbey, London, as the back drop and location of the Italian brands cruise 2017 show today. Despite opposition from religious figureheads, the show went ahead and was the first ever fashion show to be held at the venue. 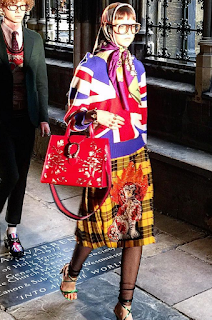 This was yet another European brand who chose England to hold their show this season, with Dior showing two days before. Michele took inspiration from Britain, including nods to Victoriana, punks and posh school systems, but of-course the designer added his own spin to the collection. Guests were seated on the church pews and the Scholar Cantorum Oxford Choir sang to accompany the show. 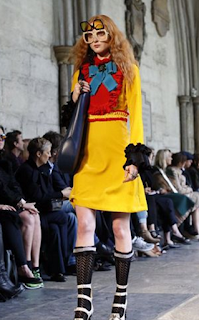 The collection featured many floral motifs, which was similar to the Dior show that was held at Blenheim Palace earlier this week. 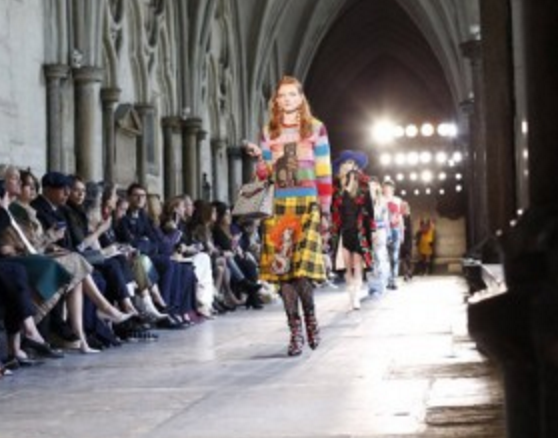 Also featured were many Victorian ruffles, punky checks, an eccentric color palette and a Union Jack jumper. In addition, many pieces included royal style references which fitted well within the venue. See some of the pieces below.